You know you’re planning on going to Vegas for SEMA. Don’t you want an extra $25-$50 to blow at the tables? Register for the Specialty Equipment Market Association Show by Friday to save $25 and receive your badge before the event, the Society of Collision Repair Specialists reminded the industry Wednesday. After Oct. 16, you’ll have to pay $75 to attend the show. Friday’s also the last day to save $25 on a full pass to all SCRS Repairer Driven Education events during SEMA Week. After Friday, the passes — which let you into any RDE event, including the Nov. 5 OEM Collision Repair Technology Summit and the SCRS Sky Villa after-party that day — increase to $400. Register and learn more about the classes at www.scrs.com/rde. Even at the $400 price point, the full RDE pass could still quickly pay for itself if you’re interested in even just a handful of the sessions. Any one session costs $75 if you register before Friday and $85 afterward, and the Sky Villa party is $85 before Friday, $100 at the gate. Perhaps the main event of the entire week is the Thursday OEM Technology Summit, which SCRS calls “one of the most lauded additions” to the SEMA educational lineups. 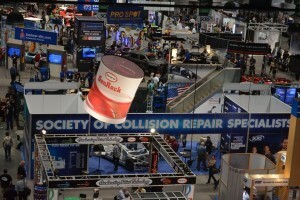 “The Summit is designed to put SEMA Show attendees in a room with innovators in automotive structural design and technology and will focus on emerging trends in vehicle construction and technology, and how both of those aspects influence vehicle repairability and collision industry preparation,” SCRS wrote. Summit guest stars include Doug Richman, vice president of engineering and technology for Kaiser Aluminum, and Blake Zuidema, director of automotive product applications for high-strength steel manufacturer ArcelorMittal. Audi, Fiat Chrysler, General Motors, Honda, Mercedes and Toyota will also send representatives to discuss the evolution of automotive design and collision repair. Onsite registration will be available at the SEMA registration area at the Westgate Las Vegas as well as outside the RDE venue of Rooms N231-N241 at the Las Vegas Convention Center North Hall. Sponsors this year included AkzoNobel, the Alliance of Automotive Service Providers, AudaExplore, BASF, CCC, Ford, General Motors, Global Finishing Solutions, LKQ, Paint Body & Equipment Specialists, PPG, Pro Spot, Spanesi, Sherwin-Williams and Toyota.